Ireland’s Daniel Coyle won the Seven-Year-Old Young Jumper competition, sponsored by Bell Media, on Friday, July 21, at the CSI3* Ottawa International Horse Show at Wesley Clover Parks in Ottawa, ON. A starting field of 11 young horses jumped the track set by Anthony D’Ambrosio, with four leaving all the rails in place to advance to the jump-off. Riding Farrel, Coyle was again clear in a time of 34.30 seconds to take the win over Jonathan McCrea of the United States, who had crossed the timers in 39.28 seconds riding Lapino, an Oldenburg gelding (Lord Pezi x Ferragamo) for owner Candy Tribble and Windsor Show Stables of East Windsor, CT.
Finishing third was Sarah Johnstone of Collingwood, ON, who posted the fastest four-fault effort in the jump-off riding Zalandra, a Dutch Warmblood mare sired by Zento. Owned by Western Sales & Development, Zalandra enjoyed consistent results throughout the CSI3* Ottawa International Horse Show to earn the overall Young Jumper High Point Award. Friday’s victory belonged to Coyle, 22, who rides for Susan Grange’s Lothlorien Farm in Cheltenham, ON. His winning mount, Farrel, was purchased by Grange and her daughter, Ariel, at the VDL auction held in March in Wellington, FL, where Lothlorien has a winter training base. “Sue and Ariel always have bought one or two horses at the auction, and this one had a very good record,” said Coyle of the seven-year-old bay Dutch Warmblood gelding (Cardento x Stakkato). “He’s actually very green for a seven-year-old. He does get a little green sometimes and has a fence down here or a fence down there, whereas the other seven-year-olds that Sue has are a little bit more ahead. He’s very good, though, and I’m sure he’ll come through to the top. A first-time visitor to Wesley Clover Parks, Coyle is competing with a total of nine horses throughout the CSI3* Ottawa International Horse Show. Prior to the start of the Seven-Year-Old Young Jumper competition, Wesley Clover Parks’ grass grand prix field hosted 1.35m Open Jumper competition, presented by AMJ Campbell. Jonathon Millar of Perth, ON, topped the 20-horse starting field riding Hanna van HD, a new addition to the Millar Brooke Farm team. While Millar stopped the jump-off timers in 33.05 seconds, Mario Deslauriers of New York, NY, finished close behind in 33.40 seconds riding Can Cun 2. Kevin Maxie of Erin, ON, and Carino rounded out the top three with a jump-off time of 34.21 seconds. 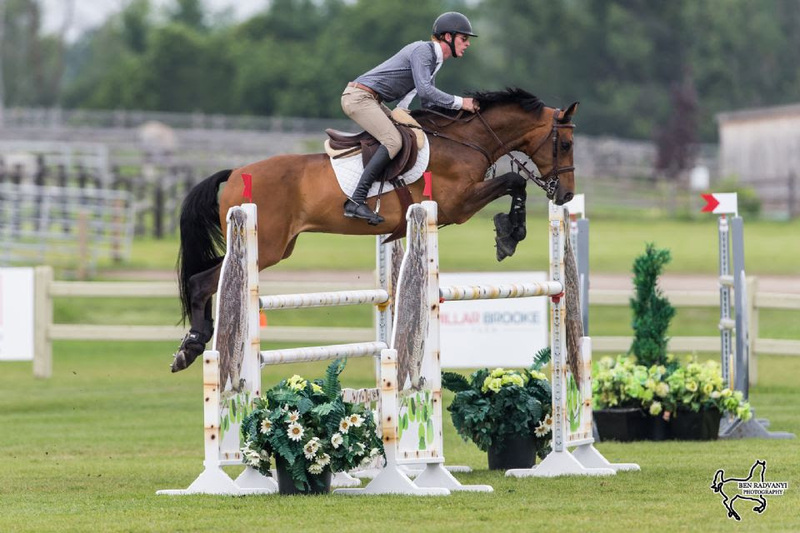 International show jumping competition continues throughout the weekend, highlighted by the $100,000 CSI3* Grand Prix at 2 p.m. on Saturday, July 22, and the $35,000 CSI3* AECON Jumper Classic at 2 p.m. on Sunday, July 23. For more information on the CSI3* Ottawa International Horse Show, visit www.wesleycloverparks.com.